Cobra Sport Cat Back System (Non-Resonated). Pipe Diameter: 2.5 (63.5mm). There are multiple tailpipe choices available for this product. More information on each tailpipe option can be found below. Please message us with your choice of tailpipe when placing your order. 6" x 3" VXR Style. Cobra Sport performance exhausts enhance the sound, looks and quality of your vehicle giving you the ultimate driving experience. This performance exhaust is made in 2.5/63.5mm pipework and fits from the catalytic converter section backwards (Cat-back) these exhausts replace the centre and rear sections. This non-resonated exhaust makes the system louder as it excludes the centre silencer and therefore, has a sportier exhaust note. This exhaust however, is also available as a resonated version (including centre silencer) which is a quieter option. All relevant fittings and gaskets are supplied. Delivering an even harder performance edge to Vauxhall's brilliant Astra H VXR are the new Cobra Sport performance exhaust systems. Cobra Sport Sales Manager, Matt Thomas says,'The sound we have created for the Astra H VXR it pitch perfect offering a much deeper and aggressive tone than standard. The free flowing systems allow for impressive performance gains with both the cat back and full turbo back systems recording increases'. Independent rolling road testing of the non resonated turbo back exhaust system with de-cat before any other modifications revealed a +16.8bhp increase in horsepower. The outstanding power results are complemented by a significant weight saving. The Cobra Sport cat back system weighs in a huge 33% less than the OE system at only 10.52kg. Great sound comes as standard with Cobra Sport. The unbelievable resonated sound quality is pitch perfect, behind the wheel or on the start line. At idle the volume of the resonated turbo back exhaust with sports cat increased by +13.7dB and recorded a bold 85.4dB on the 4,000rpm static sound test. 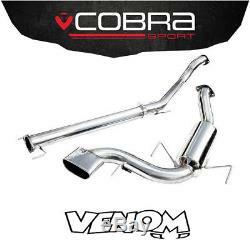 Unrivalled quality is the hallmark of every Cobra Sport exhaust. Each exhaust is engineered to the highest tolerances. Mandrel bending of the stainless steel tubes ensures clean airflow. Jig manufacturing and TIG welding procedures ensure great looks and a superlative finish. The Astra H VXR exhaust systems are finished with a choice of highly polished T304 tailpipes, finishing off the rear of the VXR beautifully positioned perfectly within the built in tailpipe outlet. 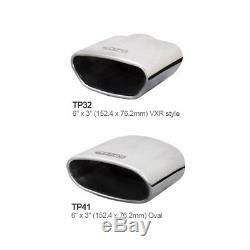 Tailpipe options include VXR style and oval tips both measuring 6' x 3 (152.4mm x 76.2mm). The item "Cobra Exhaust 2.5 Cat Back System (Non-Res) Vauxhall Astra H VXR (05-11) VX71" is in sale since Saturday, September 2, 2017. This item is in the category "Vehicle Parts & Accessories\Car Tuning & Styling\Performance Exhaust\Complete Performance Exhausts". The seller is "venommotorsport" and is located in Preston. This item can be shipped to United Kingdom.